There is nothing actually wrong with this kitchen....except that I LOATHE it. I never liked it when we had it out 10 years ago and I dont like it now. It is an "in the round" type kitchen for lack of a better description. All that means is that it has to sit smack in the middle of the floor if you want to play sink AND stove. All the doors perpetually hang open and nothing fits inside it. I have a big ugly rubbermaid box next to it to hold all the accessories and that is just tacky. It is sitting in our living room for heaven's sake....along with 10 million other things so another rubbermaid box is the last thing we need. So, last week I was inspired by some kitchens I saw here. I would be more specific, but there were many, many inspirations--mostly ones based off Ikea shelving and found objects. Do a search and you will see many. May I also say that I have an unnatural love for that website. Beautiful ideas abound so check it out. Anyway, I decided we could do this on the cheap and have something I dont mind walking past when I head to the living room. We were standing in the basement and I drew a little plan on some scrap paper and put measurements of the approximate size I wanted. We stood there and figured out how much wood we would need and headed to Lowes. In the end we spent $22 on two MDF stair tread things for the sides, a piece of pegboard for the back--both revisions (improvements) of my plan by the dude who has to build the thing--and a clearance handle that turned into a towel rack. I went to Michael's and Walmart the next day and got all the little odds and ends that I wanted for the top (I had a vision, dontcha know) and the baskets for storage. 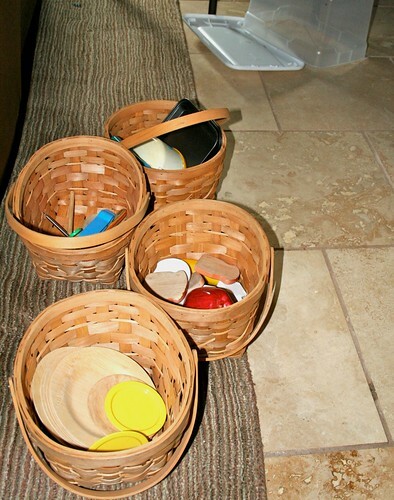 That I think was about $30 with the baskets. The butcher block counter top was a scrap from my parent's new kitchen. It was definitely a joint project. Chris was responsible for the structure of the thing, shelf building, etc. 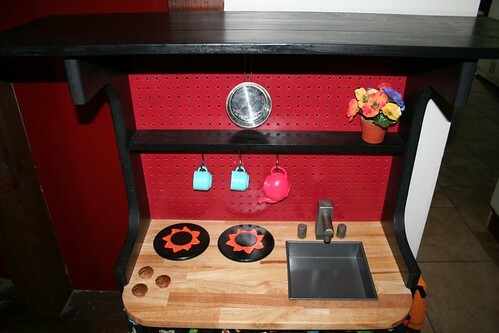 I did the sanding and painting, designed all the little knobs and burners and actually ended up making the faucet and knobs since I couldnt find a real faucet anywhere for less than $30. Oh, and I made the curtain too. I was going all black except the countertop, but Chris suggested the red back--good choice. I love it. The fabric that I had mentioned earlier turned out as adorable as I had hoped. Here is hoping it stays in place. I am very, very happy with it. 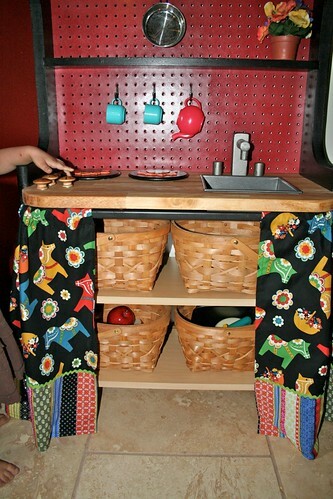 I have some more pegboard hooks I am painting for the back and I am making her an apron and a couple pot holders to match the curtain but other than that, this project is FINIS!! Total price a hair under $60. If you click on the pics it will take you to Flickr and you can see lots more of the pictures. Now, oh sister of mine, what do you want me to do with YOUR kitchen?! oh my gosh!! 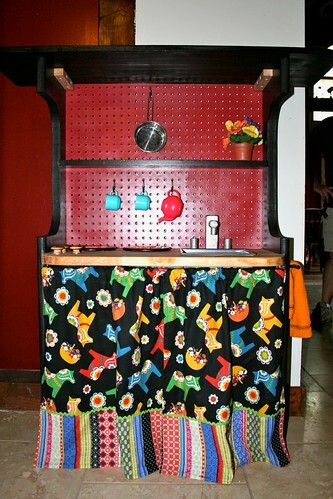 so im gonna go ahead and put my order in for my future childs kitchen!! super cute i agree!!! i kinda would like one now for myself!! Trash the trash, becauseI am proud to say I will be inheriting this very kitchen, even if its for the four sons, so PAWS OFF! The window sill potted plant is a lovely touch may I add. And I think the burners are my most favorite. Yes, you will inherit because it is VERY sturdy. I will take the vintage to goodwill today. How darling! 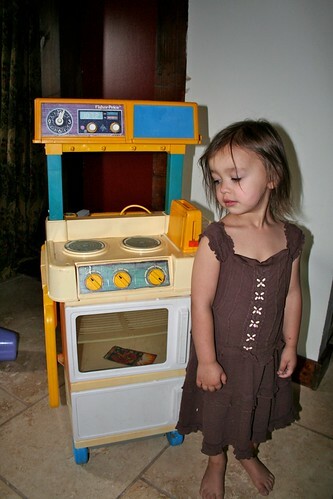 As a kid I always wanted the Fisher Price kitchen!